My perfect gaming-programming setting was disrupted when the Dell attempted suicide. The problem was diagnosed as some kind of a system board failure, but couldn't be fixed. I stopped programming for a few days and when I had confirmation from the first computer repair shop that it couldn't be fixed, I just went to the nearest dealer and got myself a Sony Vaio (You might want to refer to this as to why I jumped ships from Dell to Sony). I got Connectify Lite and that is when I realized that my Dell had the full version installed. 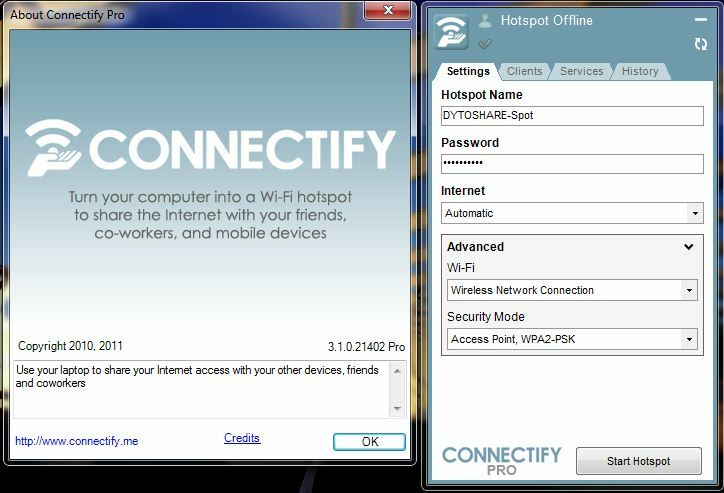 Connectify refused to share my USB internet through the hotspot. That is what made me want to pull my hair out. 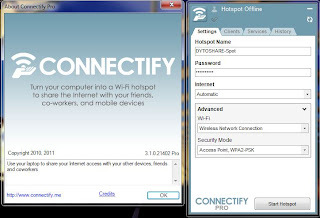 All the people in my college use Connectify to connect their cellphones (and tabs and iPods and iPads and watches and what not) to the LAN power. At any time, if you check the wifi networks, you would find connections ranging from "Connectify-Nani" to "Connectify-DarthVader"! That is why, over the past year, I had come to think of "Wifi Hotspot" and "Connectify" as analogous terms. The solution? Create an Ad Hoc network (preferably with a password, unless you want someone to finish your precious bandwidth) and share your network over it. There is an issue with the ad-hocs though. They tend to disconnect the internet with their network after some time for some unknown reason. Also, if you run an ifconfig command on the client side to check the IP address, running it on the browser of the host doesn't really work (maybe it's the firewall playing spoilsport, but who knows?) So, I stopped trying and got myself Connectify Pro!